Luxury brands are, in some ways, in a league of their own. For example, there is a purse made by Hermes called the Birkin bag. One recently sold for more than $379,000. CNBC covered the story with an interesting introduction. Of course, they are correct. If you would consider shopping for a house that costs nearly $400,000 than you aren’t in the market for a Birkin bag. The bags start at an estimated $10,000 and there is a waiting list to purchase directly from the manufacturer. Who would want one of them? Celebrities, of course, and individuals looking to impress. These are the type of customers that are always willing to buy what they want and are believed to be relatively immune from the ups and downs from the economy. The same idea can be applied to the car market. Mass market auto makers like Ford and GM are sensitive to the economic cycle. They understand they will see sales falls during a recession. But, some car manufacturers are relatively immune to that problem. They make expensive cars and have few potential customers. Among those auto makers is Ferrari N.V. (NYSE: RACE), a company that began trading in December 2015 and whose stock almost immediately became a favorite of momentum traders. The stock is up more than 200% since its lows last July. Ferrari is an Italy-based designer, manufacturer and retailer of sports. Its sports cars portfolio includes, among others, F12berlinetta, FF, Ferrari 488 GTB, 488 Spider, 458 Speciale, Ferrari California T, F12tdf and LaFerrari. The Company also offers financing services through Ferrari Financial Services. It also produces limited series and one-off cars. According to Car and Driver, its cars are highly rated with all models carrying at least a four-star rating. 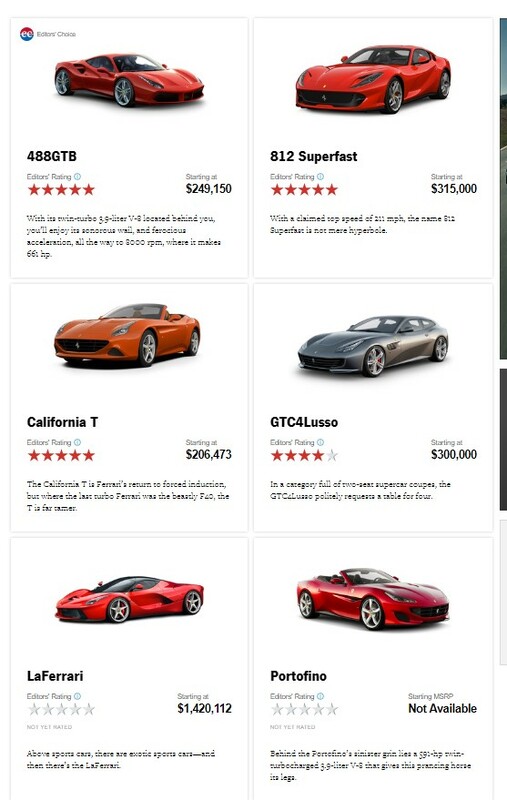 Prices start at $206,000 for the California T model and rise quickly to over $1 million for the LaFerrari. Like with Birkin purses, if you are asking whether to buy a house or a car, you cannot afford the car. This, at least to some degree, provides the company with a recession-proof market. On Thursday, the stock sold off after being downgraded to underweight from overweight by Morgan Stanley. This is a significant downgrade since analysts bypassed the “market weight” or neutral ranking and indicates a sense of urgency to decrease exposure to the stock. Analysts cited new competition from other high end auto makers like McLaren, Aston Martin and Lamborghini as a threat to Ferrari’s sales. Morgan Stanley is also concerned that the company could stumble on pans to enter the SUV market. Analysts are concerned that this exposes the company to a relatively unfamiliar segment with unknown customers. Ferrari is expected to announce a four-seat utility vehicle in a move the company believes could double its profits by 2022. But, it comes with risk and Wall Street is often averse to risks. The stock is priced well above its peers and could be considered overvalued. Earnings per share (EPS) are expected to be $2.67 this year and grow at about 11% a year in the next few years. After Thursday’s decline, the stock was trading with a price-to-earnings (P/E) ratio of about 40. This is more than three times the long run industry average of 13. Now that analysts are focused on the risks, the stock’s valuation could become a concern. Even if the stock doesn’t decline much, in the short term, RACE seems unlikely to rally sharply given its rich valuation. This means traders should consider using an options strategy known as a bear put spread to benefit from the expected price move. The bearish outlook for RACE, at least for the purposes of this trade, is a short term opinion. In the long run, this stock could move significantly higher. But, for now, RACE is likely to consolidate or drift lower for a time. To benefit from a potential selloff, traders can buy put options. A put option gives the trader the right, but not the obligation, to sell shares at a specified price until the option expire. While buying a put is possible, it can also be expensive. The risk of loss when buying an option is equal to 100% of the amount paid for the option. Specifically, the October 6 $105 put can be bought for about $1.80 and the October 6 $103 put can be sold for about $0.60. Because each contract covers 100 shares, this trade will cost about $1.20 to enter, ignoring the cost of commissions which should be small when using a deep discount broker. The maximum loss is experienced if RACE remains above $105. In that case, both options would expire worthless. That would result in a loss of $120, the capital outlay at the time the trade was opened. The maximum gain on the trade is equal to the difference in exercise prices less the premium paid, or $1.80 in this trade ($105 – $102 = $3; $3 – $1.20 = $1.80). Again, since each contract covers 100 shares, the maximum gain is equal to $180. Most brokers will require you to maintain a deposit equal to the equal to the risk on the trade as the margin requirement, or $120 to open this trade. That is a potential gain of 150% on the amount risked in the trade. This trade delivers the maximum gain if RACE closes below $103 on October 6, when the options expire. If RACE closes between the exercise prices of the two option on that day, the gain will be less than $1.80. There are risks to this trade. Those risks, in dollar terms, are relatively small, about $120 for this trade in RACE. If the trade delivers its maximum potential gain, an investor risking $120 would more than double their money.